What is it like to lose yourself, piece by piece? What is it like for your loved ones to watch you disappear, knowing that there is virtually nothing they can do to stop the process? 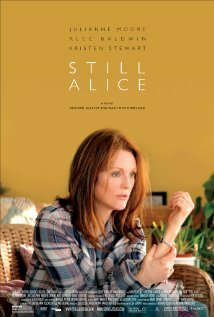 Watching the film Still Alice (based on the book by Lisa Genova) gives us some insight into the devastation that Alzheimer’s Disease causes. This shattering condition decimates the lives of both its sufferers (or as Alice describes them “strugglers”), and those who are forced to watch the path of destruction it weaves. Julianne Moore sensitively portrays the role of Dr Alice Howland, a linguistics professor at Columbia University, described by her husband as ‘the most intelligent woman I ever met’. 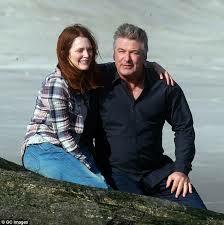 John Howland, played by a somewhat hesitant Alec Baldwin, is himself an academic and battles to come to terms with the rapid deterioration in his wife’s condition once she’s diagnosed with Early-Onset Alzheimer’s Disease, shortly after her 50th birthday. The stellar support cast of Kate Bosworth (Anna), Kristen Stewart (Lydia) and Hunter Parrish (Tom) all lend their individuality in their roles as Alice’s children; each with their own life, and their own decisions to make. They are typical siblings: selfish and bickering one minute, supportive and loving the next. Directors Richard Glatzer (himself an ALS sufferer) and Wash Westmoreland have chosen not to bring us an over-emotional tearjerker, but rather a penetrating, accurate look at the differing, but highly believable reactions of Alice, her husband and their three grown children. Yes, what’s happening is a tragedy – even more so as the condition is hereditary, but it has to be dealt with and each must do so within their own capacity. Moore is most deserving of the acclaim she’s currently receiving and that Academy Award is well within her grasp. She doesn’t just play a part, but takes us into her head, where we feel her sense of fear, confusion and frustration. I literally gasped at her inability to tie her shoelaces! Her desperation to hold onto each part of her being before it’s forever lost is palpable and the visual depiction of her deterioration is superb. This is a gentle, beautiful interpretation of a distressing and destructive disease. It gives us an introspective look into a soul-destroying condition and one cannot help but wonder what they’d do under similar circumstances.